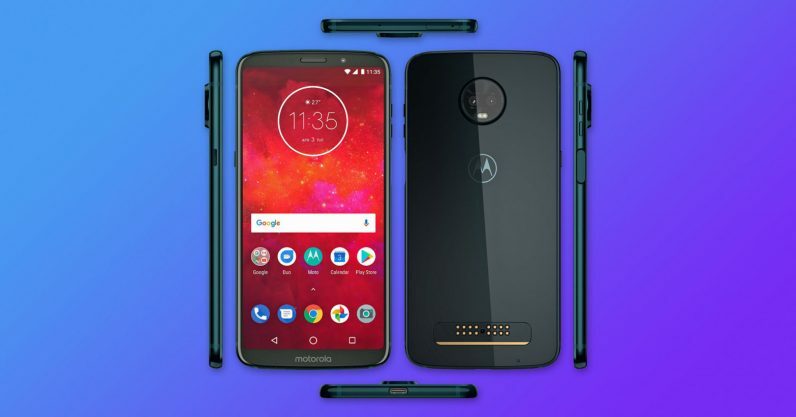 While everyone was busy recovering from Microsoft Build and Google I/O, ever-reliable leaker Evan Blass shared images of the Moto Z3 Play on Twitter yesterday. It gives us our clearest look at the device yet, after an initial blurrycam leak a week ago. It’s still modular, but this time seems to have a glossy back, in line with the recently-announced Moto G6. The most obvious change: The bezels are finally up 2018 standards, increasing the screen real estate while incorporating a longer 18:9 aspect ratio. Curiously, the render also shows a side-mounted fingerprint sensor, instead of the rear placement on most devices with tiny bezels. We don’t know anything about the phone’s specs, but the Motorola’s Z Play phones tend to fall on the high side of the midrange category. I wouldn’t expect a Snapdragon 845 and anything beyond 4GB of RAM, but past models have shown themselves to be solid performers thanks to near-stock Android and solid optimization on Motorola’s side. The phone also has dual cameras in tow, another trendy feature which was previously only available on the high-end Moto Z Force last year. One trend users won’t appreciate? There’s no headphone jack. The company did so on last year’s Z2 Force as well, but I thought it would’ve stuck around for the more budget-oriented model. Sighs. Maybe you’ll need a Moto Mod for that now.